Apple’s iMessage service allows you to send free Messages to friends, relatives and practically anyone using an Apple Device. While the iMessage service is very reliable, it can stop working on an iPhone, in which case you can try out the following solutions to fix the problem. The problem of iMessage not working on iPhone could be due to a variety of reasons, ranging from poor network connectivity, Incorrect iMessage Settings to Minor Software glitches, which might be preventing iPhone from sending and receiving iMessages. Since there are multiple reasons for the issue, we are providing below multiple fixes that users experiencing similar problems with iMessage have tried to fix the problem of iMessage Not Working on iPhone. It is quite possible that you or someone with access to your iPhone has ended up accidentally disabling the iMessage option on your iPhone. 1.2. On the Settings screen, scroll down and tap on Messages. 1.3. On the Messages screen, enable the option for iMessages by moving the toggle to ON position (See image below). 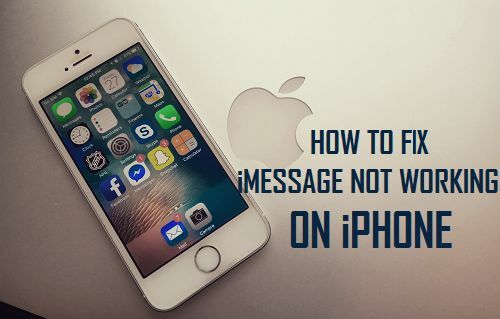 In case you see “Waiting for activation…” error Message after enabling iMessage, you will need to fix this error Message by following steps as mentioned in this article: How to Fix iMessage Waiting For Activation Error on iPhone. 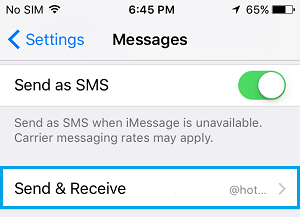 One of the most common reason for the inability of an iPhone to send and receive iMessages is due to incorrect Send/Receive settings. 2.1. Open Settings > Messages. 2.2. On the Messages screen, scroll down and tap on Send & Receive. 2.3. 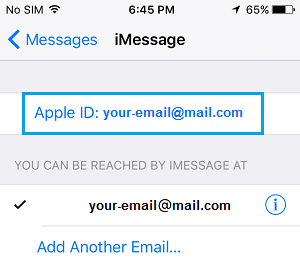 On the next screen, make sure that both your Apple ID is listed under “You Can Be Reached By iMessage At” section of iMessage screen. iMessage makes use of Apple ID to send and Receive iMessages. Hence, it is necessary that your Apple ID is listed under “You Can be Reached By iMessage At” section in addition to your Phone Number and other Email Addresses. Sometimes the problem of iMessages not working on your iPhone could be due to a minor glitch caused by an old iMessage that somehow ended up getting stuck in the iMessage process. In order to fix this issue, you can try deleting the last iMessage that you had received prior to the start of this problem. In case required, try deleting other old iMessages and see if this helps in fixing the problem. Even if your iPhone appears to be connected to internet, there could be minor software glitches interfering with delivery of Messages on your iPhone. Follow the steps below to fix minor software glitches on your iPhone, which might be causing your iPhone to lose network connectivity or interfering with the iPhone Messaging system. 1. 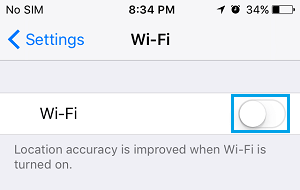 Tap on Settings > WiFi/Cellular. 2. On WiFi/Cellular screens, turn off WiFi/Cellular. Note: iMessages can be sent using both WiFi and Cellular Network. 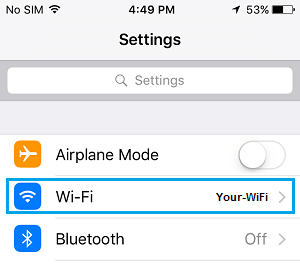 Hence, you will need to Turn OFF/ON Cellular network as well, in case you are using a Cellular Plan on your iPhone. 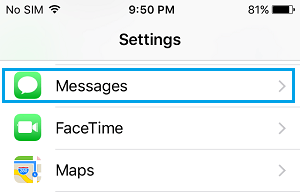 After following above steps for both WiFi and Cellular Networks, try sending an iMessage and see if you are able to send and receive iMessages on your iPhone. 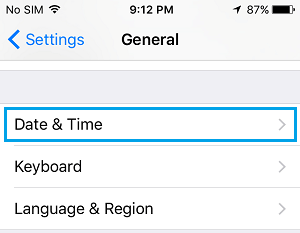 The iMessages problem on your iPhone could also be due to Date and Time not being set properly or somehow getting misconfigured on your iPhone. This issue can be easily fixed by following the steps below. 1. 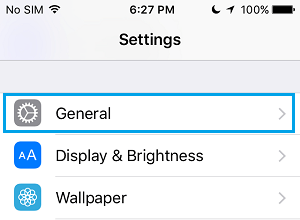 Tap on Settings > General. 3. 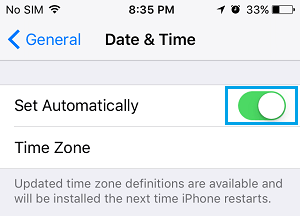 On Date and Time screen, Enable the option for Set Automatically to ON. 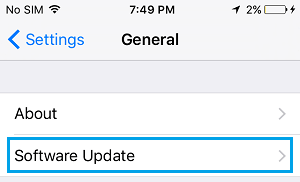 Make sure that your iPhone is not waiting for you to install an iOS update. Although, an iOS update should not interfere with iMessage, it is quite possible that your iPhone has not been updated to latest software updates from Apple and this is leading to iMessage problems on your iPhone. 2. On the next screen, scroll down to the bottom of the page and tap on Software Update. 3. On the next screen, see if there are any updates available and tap on Download to Install the updates to your iPhone.